“You’re distracted,” Lizzie said. The asymmetrical white splotch on her tabby face made her look sloppy and unprepared, even when she was dressed in her prim skating leotard with her ice skates tightly laced up her hind-paws. “Yeah…” Marge admitted. She couldn’t help glancing back to the bleachers every few seconds to keep an eye on her litter of pups. Five big Newfoundland puppies can cause a lot of damage when they’re unattended, and Marge was barely attending them. She’d left them with a bag of snacks and games, and now she was down on the ice. Marge held out her big brown paw. She felt like a bear on the ice with all these cats and small-breed dogs. There was even a pair of squirrels in red-spangled leotards doing flips and pirouettes down at the far end of the rink. Their tails twirled around them. Marge didn’t know how to skate like that. She only knew hockey. Marge the Barge. That’s what her team had called her. Now what was she supposed to be? Margerina Ballerina? Ugh. She didn’t want to be a figure skater. She didn’t like the plain black leotard Lizzie had convinced her to wear. It was too form fitting for a bulky dog like her, mashing her shaggy fur down. She missed her baggy hockey jersey. Lizzie took Marge’s paw and the two of them, small tabby and big Newfoundland, skated out onto the ice in tandem. Lizzie’s tail swished. Marge could feel the little cat picking up speed, but she didn’t speed up with her. Her paw let go, and Lizzie skated away. Abruptly, Lizzie pirouetted — elegant, fast, feline. Everything Marge wasn’t. She stopped, facing Marge. Marge glanced at her pups in the bleachers again. Jo Jo and Kiki were laughing and watching her. Were they laughing at her? Probably not. But Marge’s face burned hot under her thick fur anyway, in spite of the ice cold air. “I don’t want to do this,” Marge woofed, voice low. Jo Jo and Kiki were definitely laughing now. Something inside Marge snapped. She belonged on the ice. She belonged there more than these frippery little cats and dogs did. When she skated, she could fly. She could skate faster and stronger than any little tabby, squirrel, or Chihuahua. Marge shoved off with her hind-paw. She put all her weight into pushing her bladed paws into the ice. As she whipped past Lizzie, she reached out and grabbed the little cat’s paw. The two of them skated, side-by-side, around the rink, and when they returned to where they’d started on the ice, Marge slammed her blade hard to stop. Lizzie zipped past her, and Marge grabbed the small cat around the waist, flung her into the air, higher than any of the other skaters. Then Marge dumped the nimble tabby back on her own feet. Lizzie’s skates skidded, and she twisted her lithe striped form into a quick pirouette to cover for the moment of indignity. Lizzie explained how to use the jagged edge at the front of the figure skate — something hockey skates didn’t have — to catch the ice and kick yourself into the air. Marge grumbled, but she cooperated. When it came down to it, she’d rather be on the ice, being ordered around by a little tabby, than at home moping about her injury. She’d already seen three doctors. The peripheral vision wasn’t coming back. If she wanted to skate competitively, it was prance around in a stupid leotard with Lizzie or nothing. Her first attempt at a toe jump led to a face plant. 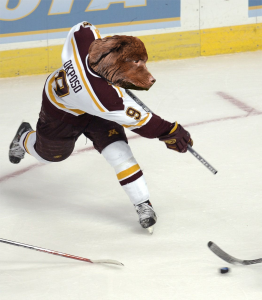 She was used to smashing her muzzle into the ice — pro-hockey was a rough sport — but she hadn’t expected to fall while figure skating. No one was trying to knock her down, so what reason did she have to fall? Five more attempted toe jumps led to five new ways to fall. It was like the ice itself was out to get her. Marge felt bruised all over. Her body hadn’t taken a beating like this since she was a pup. Slamming into other hockey players — everyone coated in layers of padding — was one thing. Repeatedly slamming into the hard flat ice itself? With only a flimsy leotard to cover her? That was something else. When Marge said she belonged on the ice, this wasn’t what she meant. Marge expected Lizzie to argue, bully, or plead. But she didn’t. She just skated off, ears flattened against her head like she was really angry. 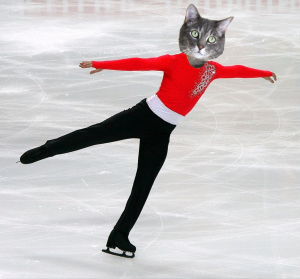 She kicked one hindpaw hard into the ice and jumped into a triple aerial spin. She followed it with a double spin in the other direction. She skated all the way around the rink, spinning so much it made Marge dizzy to watch her. When Lizzie got back to Marge, she held a paw out to the big dog, ceremonially offering to help her up. Marge ignored the little tabby’s paw and lumbered up from the ice on her own. It was time. Her tail was getting cold. “Practice is the same time tomorrow,” Lizzie said. “I’ll expect a better attitude.” Then she skated away again. This time her ears held high and her striped tail swishing. “You could at least give me an inspirational speech!” Marge woofed after her, but Lizzie was clearly done with her for the day. That was okay with Marge. She was done with figure skating entirely. She couldn’t get off the ice and out of the stupid figure skates Lizzie had bought for her fast enough. It had been ridiculous of Lizzie to special order figure skates large enough for a Newfoundland. Marge had warned Lizzie that she wasn’t sure about figure skating, so it was Lizzie’s own fault for wasting all that money. While Marge unlaced the skates, her pups hopped over the bleachers and swarmed around her. “Mom, you were terrible!” Jo Jo barked. Marge threw an arm around Junior’s shoulder and gave him a squeeze. He was sweet, but that didn’t change how she felt about figure skating. She didn’t skate to be beautiful. She skated to fly. The next afternoon, Marge drove over to pick her pups up from school, telling herself it would be nice to spend some quality time with them instead of rushing off to the ice rink. That had been the one advantage of being kicked off the hockey team: more evenings and afternoons free. Allison was a tiny little Chihuahua. Marge was amused by the idea of her parents trying to feed Jo Jo and Kiki — they could probably eat as much at one dinner as Allison ate in a week. But Marge wasn’t about to get in the way of her kids’ social life. Before Jo Jo could swing the door shut, Fred pushed past her and said, “My study group is meeting in the school cafeteria. Taylor said I could ride home with her.” He slammed the door and ran off before Marge could tell him that was okay. “For a paper?” Marge asked, pulling the car back onto the street. Marge let Tim out in front of the city library and told him that she’d be back to pick him up when the library closed — just before dinner time. That left her and Junior alone in a big car, meant to hold a family of seven Newfoundlands. “Oh,” Junior said. Then he got quiet. He did that sometimes. He was the only one of her pups that Marge could ever describe as quiet. Marge didn’t want to go back to the ice rink, but she did need to take her skates back to Lizzie. It was possible Lizzie could still return them. They’d barely been used. Marge supposed it wouldn’t be so bad to sit in the bleachers with Junior and watch all the little dogs, cats, and squirrels doing their pirouettes for a while after dropping the skates off. Of course, Marge should have known that Lizzie wouldn’t let her simply drop the skates off. That little tabby talked circles around her — while Junior said unhelpful things like, “You would look so majestic doing a spin, Mom!” — until Marge found herself changing out of her shoes and into the special ordered figure skates. At least, this time, Lizzie didn’t make her wear the ridiculous leotard. Marge left her street clothes on. None of the other skaters had anyone cheering for them during practice. Yet, even though his cheering made her feel conspicuous — not that her size didn’t do that enough — it still warmed her heart. Sometimes, she felt invisible to her pups, nothing more than a ride to and from school or the library. It was nice to have one of them cheering her on. Marge copied the tabby’s pose. “Move them off to the side and–” Lizzie swung her arms, bent her knees, pulled her paws in, and was suddenly spinning. “Make sure to pull your paws in close. But if you’re spinning too fast, put them back out.” Lizzie moved her arms in and out, speeding and slowing her spin. Out of the corner of her eyes, Marge saw Junior in the bleachers spinning around, copying Lizzie. Nearly half a dozen other skaters on the ice were doing spins at that moment too. One skater, a spindly Italian Greyhound in a dark blue leotard, had stopped skating to watch Marge’s lesson. She didn’t know what his problem was, but she suddenly felt like the one thing she could do to make him stop staring was to start spinning. She swung her arms, bent her knees, and pulled her arms in close. The ice rink spun around her. Marge felt like a mountain, steady in the center of a whirlwind. As her spin slowed down, her jowly face broke into a grin. That had felt like flying. Marge spun again. And again. “I see you’ve found a student, Lizzie,” the Italian Greyhound said. “Given up competing and switched to teaching, have we?” His words were full of condescension, but his voice was full of kindness. It was very confusing. Especially since he kept zipping past Marge’s vision. She slowed her spin and came to a stop. “A partner, not a student,” Lizzie said. Her voice was even, but her tail twitched furiously. “Gerard. Lizzie’s ex-partner.” He held a miniscule paw out. Marge tried to shake it gently. He looked like she could crush him by breathing on him. Gerard smiled apologetically at Marge, as if offering his condolences for her having to put up with Lizzie. “Well, best of luck. I’m sure you’re on a tight schedule.” He skated away, lazily zigging and zagging, almost ostentatiously keeping his skates firmly on the ice until he reached the far side of the rink. Then he kicked one hindpaw into the ice and launched into a quadruple aerial spin. It was very impressive and highly intimidating. Marge and Lizzie practiced every day. Most days, Junior came and did his homework in the bleachers. Some days, Marge had all five of her puppies cheering for and laughing at her. Unfortunately, she gave them plenty of opportunities to laugh. She was good at spins, and Lizzie said she had an uncanny knack for synchronized choreography. But Marge couldn’t get the lift that she needed for aerials. Every time she tried to kick herself up into the air, she ended up with her tail — or her face — smashed into the ice. “Still having trouble with those toe jumps?” Gerard had taken to commenting on Marge’s lessons nearly daily. He punctuated his question with an infuriatingly perfect single aerial spin. “Maybe you need more speed going in, since you have more mass to lift.” He looked Marge up and down. She felt very large under the tiny dog’s scrutiny. Marge watched Gerard practicing flips on the far side of the rink alone and tried to picture the kind of routine he might have done with Lizzie. She couldn’t picture him lifting Lizzie for a throw jump at all. He didn’t look strong enough. He might be big enough to lift a squirrel. “Does Gerard have a new partner?” Marge asked, realizing she hadn’t seen him skate with anyone during the last few weeks. The death spiral came easily to Marge. So did lifts, twist lifts, and every kind of throw jump. Marge and Lizzie’s extreme size differential meant that they had the potential to do throws that most of the other figure skating couples didn’t have a chance at. In addition to mere size, Marge had a lot of upper arm strength; she still had to throw a puppy or two over her shoulder sometimes if they started throwing tantrums. Lizzie weighed half of what one of her puppies did, so throwing the little tabby into the air was no problem. Lizzie’s skills took care of the rest — with the height and speed Marge could give Lizzie, she had time for quadruple or quintuple loop and flip jumps. Together they looked amazing. Lizzie skated a storm around Marge’s steady center. But Marge wondered if Lizzie really needed her. Her part could have been played by a catapult, a machine. Lizzie was the one really skating. As the first local competition grew near, Lizzie arranged for several private sessions at the ice rink late in the evening, so they could practice with music and without the distraction of other skaters. Marge felt strange arriving at the first session. Everything was empty and quiet. Usually, she had Junior — if not five pups — jostling and bothering her on the drive over, but these sessions were well after the pups’ bedtime. And the ice rink itself was deserted. When Marge had played hockey, there was a whole team on the ice, even for practices. The figure skating practices were usually crowded with figure skaters pursuing their own separate routines. But tonight, Lizzie was the lone cat on the ice. Marge watched Lizzie skating in loop de loops and figure eights for a while before revealing herself. She hadn’t put her skates on yet, but she called out to Lizzie, “Watcha wearin’? It looks like a cheerleader getup.” The short pleated skirt was red and white; a picture of a megaphone was emblazoned on the chest. Marge’s hackles rose. She could not stand the idea of wearing a cheerleading uniform. It was not going to happen. She went over to the bag and lifted the red and white garment out of it, touching it only with her blunt claws, like it was smelly, rotting fish. “I hope you like it,” Lizzie said. Once Marge was dressed, Lizzie ran her through the routine she’d choreographed for them. It played to Marge’s strengths — she skated fast, spun a lot, and threw Lizzie around so much that the little cat might as well have been flying — her skates barely touched the ground. The music for the routine was perfect too — a puppy-band pop song about cheering for the local team. It was bright, peppy, and matched their costumes. Marge was having the time of her life. She never would have believed it back when she was a pro-hockey player, but figure skating was fun. She didn’t feel ridiculous at all. In fact, she was so excited to practice again that she arrived early for their private session the next night. Only to find Lizzie skating with Gerard. They skated together — splotchy tabby and spindly dog — mirroring each other’s moves. Every one of Lizzie’s spectacular toe jumps was doubled. They were tied together like a dancer and her shadow. They belonged together. Marge imagined herself in Gerard’s place. Skating beside the light-footed tabby, Marge must look like a monumental blundering boulder, unable to even get her skates off the ground. When Gerard and Lizzie finished their routine — skated to a stately piece of classical music, heavy on piano and violins — Lizzie kept skating, oblivious to Marge watching them. Gerard left the ice and ran into Marge. Marge didn’t answer. She didn’t start putting her own skates on either. Marge stared at the little dog dumbly. Marge’s heart clenched looking at the little tabby. As a hockey player, she’d had a whole team. As a figure skater, Lizzie was her team. Her whole team. “I thought Gerard was a single skater now,” Marge said. Now Lizzie looked stunned. She was a nice tabby, and she was probably afraid Marge would be angry with her. “No hard feelings, okay?” Marge gave the small tabby an awkward hug, put the bag with her skates and costume down on a bleacher, and then turned to get out of there as fast as she could. “NO HARD FEELINGS?” Lizzie’s voice was a screeching yowl. It stopped Marge dead in her tracks. When she turned back to look at the little tabby, Lizzie’s ears were flat and her eyes narrowed. “I’ve put months of work into training you, and now you’re just giving up?” There is no fury like a tabby scorned. “What do you want me to do? Go back to skating with Gerard?” Lizzie spat his name through her whiskers like a curse word. “What are you talking about?” Lizzie’s ears were still flat. Marge wished she could find a way to make them stand back up again. Lizzie skated away. She did that when she was angry. When she reached the far side of the rink, she began doing toe jumps, one after another. A sequence of six, ending on a spin. That was a bad sign. She was very angry. Marge started putting her skates on, but Lizzie came back before they were all laced up. Marge wanted to argue, but she couldn’t think. She could only feel. Her eyes filled with tears, clouding the image of Lizzie skating away with her striped tail swishing. If it had been up to Marge, figure skating would never have been mentioned in her house again. She was mortified by her own behavior — she hadn’t trusted her teammate, and that had ruined everything. But when you have five puppies, very little is under control. Marge drew a deep breath, hoping the conversation would drift right past the words “figure skating.” Surely, Jo Jo and Kiki had stories to tell about their pretend games at recess, playing at being ninjas with their friend Allison. Marge loved that her giant puppies pretended they were stealthy, invisible ninjas. Though, she supposed, they did have the dark fur for disappearing into the shadows at night. But there were no ninja exploits today. “Mom — you and Lizzie should have costumes that make you look like butterflies,” Jo Jo said. The puppies began debating whether the long tails on a swallowtail’s wings would be dangerous while figure skating. To stop them, Marge said, “We already have costumes.” She knew it was the wrong thing as soon as she said it. Marge roared, “BE QUIET.” Amazingly, the puppies quieted. Marge pulled the car away from the school and said, “I need to focus on driving. Don’t bother me.” Fortunately, she’d trained her puppies early that safety while driving was of paramount importance. So, they stayed quiet. At least, until they realized that she was driving them home instead of to the skating rink. “Don’t you have practice?” Fred asked. Who was she kidding? Given a choice between silence and an uproar, five puppies will always choose an uproar. Fred berated her for having wasted all their time at the ice rink during her practices; Jo Jo called her a quitter; and Kiki bemoaned the fact that she’d been looking forward to going out for ice cream to celebrate after the big competition. “I was going to get a double scoop of peanut butter bacon ripple!” Tim just grumbled. Marge didn’t know how to deal with all of their noise and complaints, but one objection was easy to fix. Instead of taking them home, Marge drove past their house and took them to the nearest ice cream shop. “We don’t need a big competition to get ice cream,” she said. That mollified most of her puppies. Four of them were too busy picking out ice cream cones, flavors, and toppings to bother her. But Junior still wanted to know why. So, when they all sat down with their ice creams, Marge tried to explain. “Did you do something stupid?” Fred asked helpfully. At least, he looked like he thought he was being helpful. He also had ice cream on his nose. Somehow, that made it harder for Marge to be annoyed with him. “Why don’t you just skate alone?” Junior asked. Marge opened her muzzle to explain that she wasn’t any good at figure skating alone. She couldn’t do toe jumps. All she could do alone was spins. As a big dog, she was only built for pair skating — none of the smaller skaters could compare with her at throwing a partner high into the air. Skating with Lizzie was what made her good. But Junior was looking at her so adoringly. She couldn’t tell him that his mama was a terrible skater. “I don’t want to skate alone,” Marge said. Still, Junior’s suggestion gave Marge an idea. If Lizzie wanted proof that Marge wouldn’t quit, what better proof was there than signing up for the single skaters competition? If there was still time… Today was the last day of the single skaters competition. Marge was pretty sure they allowed signups any time before the competition ended, but she didn’t have a routine or a costume. No, that didn’t matter. Marge didn’t need to be good. She only needed to prove to Lizzie that she was determined to skate. “What music will you skate to?” Tim asked. Marge considered using the jersey costume, but she didn’t think it would look right without Lizzie’s costume to complement it. “My plain black leotard, I guess.” That would at least look traditional. When Marge hung up, she realized that all five of her big puppies were staring at her. “Nice way to keep your dignity, Mom,” Fred said. The others laughed. “Shut up and get in the car.” Marge herded her puppies out of the ice cream shop. The bleachers were more crowded than usual, but Marge found a spot to set up her puppies with their snacks and games that she always kept in the car, just in case. Then she changed into her leotard and skates, handed over the data-chip with the music that Jo Jo had picked to the Siamese cat managing the performers, and nervously waited her turn. She recognized some of the other competitors from the open practices. A Pomeranian whose fluffy orange fur overflowed her yellow sequined leotard skated to a piece of classical music called “The Rising of the Sun.” The music was heavy on flutes, and the Pomeranian kept raising her arms as if she were greeting the dawn. Then a squirrel in a red sequined leotard — which Marge recognized from her first day figure skating — skated to a frenetic piece of violin music. Her small size let her jump and flip higher than any of the dogs or cats, and she danced with her tail like it was a decorative scarf. Both the Pomeranian and the squirrel skated flawlessly; they both got less than perfect scores from the judges. Marge was starting to feel dizzy from nerves. She didn’t belong here. She couldn’t do this. The final competitor before Marge was an otter in a shimmery blue leotard decorated with teal swirls. He skated to orchestral music that sounded like oceans and rivers and waterfalls turned into harp, violin, and piano. His long spine bent as he spun, and he moved as fluidly as water. He couldn’t jump as high as the squirrel, but his body bent in half. He leaned so far backwards that his forepaws brushed the ice, forming his body into a loop as he spun. Then he leaned back forward and waved his tail like a rudder behind him, as if he was actually swimming along the ice. He got a perfect score. Marge started shaking her head and backing away. Then she heard a cry from the bleachers, “MOM!” She looked over to her puppies and saw them jumping up and down, pointing at a little tabby cat in their midst. Lizzie had come. Marge could do this. She had no choice. She had to do this. For her partner. Her teammate. Like always, when Marge’s skate hit the ice, her broad shoulders relaxed. She felt her back loosen. Her tail wagged. Then the twangy chords of “Country Cat, City Cat” came over the sound system. It wasn’t what Marge would have picked, but Garth McWhiskers, the orange tabby from Alabama, was Jo Jo’s favorite singer. And Jo Jo had picked. Marge kicked off and skated up to her top speed. She zoomed around the rink as Garth drawled the refrain, “It’s hard to be a country cat!” She spun in one direction, then the other. She didn’t know what else to do, so she kept on skating into spins. She raised her arms like she remembered the Pomeranian doing as Garth sang, “City cats got it made!” When Garth started yodeling, Marge decided she had nothing to lose and threw her whole weight into a toe jump. The ice rink and time stood still as Marge was in the air — her skates left the ground, and she made it through a half-rotation before wobbling her way into a clumsy landing. But she didn’t fall. And that felt like flying. Finally, the twangy guitars faded out, and Marge slowed to a stop. She bowed. Although, she wasn’t sure if she was supposed to. Then she got herself off the ice and did everything she could to ignore the dismal scores being announced over the loudspeaker. The scores didn’t matter. The only judge who mattered was Lizzie. “Oh my god, Mom. You were hilarious,” Kiki said when Marge finally made it through the crowd to her puppies. “I knew it would be funny if you skated to “Country Cat, City Cat”!” Jo Jo looked thrilled with herself, like she’d played a very clever prank. Marge would have to have a talk with her later. “The otter was really good,” Tim agreed. “You are an idiot,” Lizzie said, but her ears didn’t flatten. Marge loved that her ears didn’t flatten. If you enjoyed this story, please consider voting for it in the Ursa Major Awards. Voting is open to anyone, only takes a minute, and every vote counts!